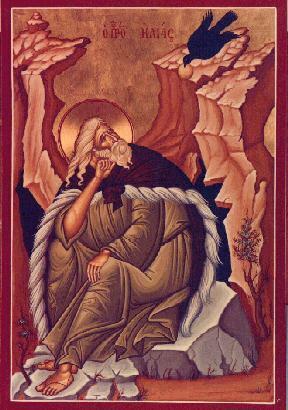 Elias (Elijah) was from Thisbe or Thesbe, a town of Galaad (Gilead)in what is now the country of Jordan. He was of priestly lineage, a man of a solitary and ascetical character, clothed in a mantle of sheep skin, and girded about his loins with a leather belt. His name is interpreted as "Yah is my God." His zeal for the glory of God was compared to fire, and his speech for teaching and rebuke was like a burning lamp. From this too he received the name Zealot. Aflame with such zeal, he spoke against the impiety and lawlessness of Israel's King Ahab and his wife Jezebel. By his prayers he shut up heaven and it did not rain for three years and six months. Ravens brought him food for his need when, at God's command, he was hiding by the river of Horrath. He multiplied the little flour and oil of the poor widow of Sarephtha of Sidon (Lebanon) who had given him hospitality in her home, and when her son died, he raised him up. He brought down fire from Heaven upon Mount Carmel, and it burned up the sacrifice offered to God before all the people of Israel so they might know the truth. At the river of Kisson, he killed 450 false prophets and priests who worshipped idols and led the people astray. He received food miraculously at the hand of an Angel, and being strengthened by this food he walked for forty days and forty nights. He saw God on Mount Horeb, as far as this is possible for a human. He predicted the destruction of the dynasty of Ahab, and the death of his son Ohozias. He divided the waters of the river Jordan, and he and his disciple Elisha passed through as if on dry land; and finally, while speaking with him, Elias was suddenly snatched away by a fiery chariot in the year 895 B.C., and ascended as into heaven, where God most certainly translated him alive, as He did Enoch (Gen. 5:24; IV Kings 2: 11). 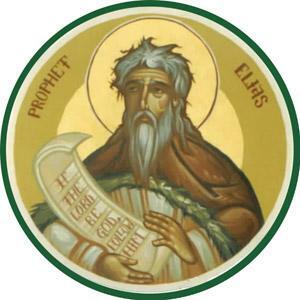 It was widely believed that St. Elias would appear before the arrival of the Messiah and Jesus himself was identified by some as being Elias returned. However, Jesus identified St. John the Forerunner (Baptist) as the Elias that was to come and proceed Him. healing for those who honor him.